kf15 | Salam, Big World! Beirut is a beautiful city by the sea; however, it’s tiny, congested and extremely expensive. So, it’s easy to say that my apartment/housing hunt has been a little difficult! Lebanon is quite expensive by Middle Eastern and Developing World standards and one of the most expensive things about living in Beirut, specifically, is lodging. Lodging in and around Hamra (the AUB and LAU neighborhood) can be as expensive as living in metropolitan cities of the US. Hamra: the surrounding neighborhood of AUB. It’s lively and full of cafes, bars, restaurants and shops. Most people you see on the street are students and foreigners. It’s also considered to be part of the “old” West Beirut, which was a Muslim/Leftist part during the Civil War. Sanayeh: the closest location to my office. It’s also the home of the Sanayeh Gardens/Park where most of the anti-sectarian protests and camping out has been taking place. It’s walking distance from the center of Hamra and Downtown. Ashrafieyh: a traditionally Christian neighborhood and part of the old “East Beirut”. Mostly residential with quite a happening bar/pub area referred to as Monot. Gimmayze: a beautiful old part of Beirut full of narrow streets and historic buildings from the French era. Historically, considered the bohemian/artistic part of town with a lively bar/pub scene. Today it has become a poshy pub and bar hopping scene. I have pretty much toured all of these areas and searched wide and far for an apartment to rent, but after my wide and long search a San Francisco friend-of-a-friend connection is what has landed me my future home for at least the next month. I will be moving into Zico House, which I think can be best described as cultural communal house with cultural and artistic programs, artists residency and a safe space for various associations. I think for any Kiva Fellow the most exciting thing about this opportunity is to meet the borrowers. It’s the desire that we all come into this fellowship needing to satisfy: the need to see, first hand, how this whole thing from borrower in the field to loan analyst in a branch to an MFI’s headquarters to a database to an online systen to a website to a lender that lends $25.00 on Kiva…and the whole cycle begins on the ground with the borrower! 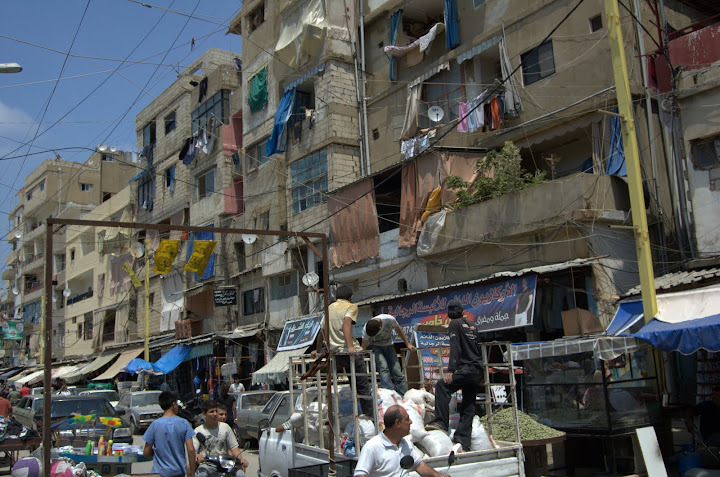 So, you can only imagine how excited I was today about my very first field visit and to add to all the excitement I wasn’t just going to go visit any territory – I was going to Sabra and Shatila (or Wikipedia) Palestinian refugee camps in Beirut. Sabra and Shatila are Palestinian refugee camps in Beirut, Lebanon that have witnessed a horrific massacre during the Lebanese Civil war at the hands of Christian Lebanese Phalangists while the camp was surrounded by the Israeli Armed Forces. During the Lebanese war, the Israeli Armed Forces was at war with the Palestinian Liberation Organization (PLO) in Lebanon. I arrived at Al Majmoua’s Beirut branch at 10 a.m. this morning. After spending an hour chatting and learning about the branch operations and procedures with Diana, the branch manager, I was introduced to Ismail, an Al Majmoua Loan Analyst. He was going to be my guide for the day. The plan was to go meet 2 new borrowers and check on a couple of existing Kiva borrowers. I had been carefully asked and semi-warned the day before by Nadine that I will be joining Ismail on his scooter or as the Lebanese call it “Motto”. Ismail’s “motto” is probably the easiest and most efficient way to zoom through Beirut’s crazy traffic. First stop was a new female borrower, Nadia, who alters and tailors clothes out of her apartment on her manual sewing machine. She wants to take a loan from Al Majmoua to buy wholesale fabric. We arrived at her neighborhood in Tarik Al Jadida and were promptly invited up the narrow stairs to her apartment. She welcomed us in and started chatting with us about how she came to know of Al Majmoua. Word-of-Mouth seems to be Al Majmoua’s strongest and most effective marketing tool. Nadia’s sister-in-law is on her 3rd cycle with Al Majmoua. Watching Ismail conduct the interview and fill out the application process was fascinating. Micro-finance core strengths is that it relies heavily on the reputation of the borrower in his/her community. Ismail was very clear about asking Nadia what amount of money she will be comfortable paying per month in order to figure out her financial standing and which loan would be best for her situation. Most micro-finance borrowers in Lebanon have little or no financial recording system of their business. For that reason the Al Majmoua application asks the borrower many questions about their current and past financial standing, trying to loosely draw a picture of their business and their needs. 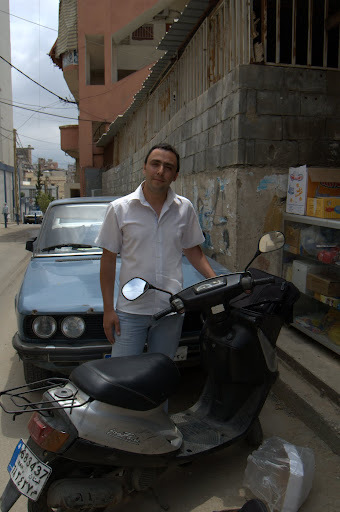 Ismail and I left Nadia’s home and continued on with our visits next stop: Sabra and Shatila. Al Majmoua offers loans to non-Lebanese citizens, any residents with legal standing are eligible for Al Majmoua’s loans. Therefore, they have a large presence in Palestinian refugee camps all over Lebanon. In Sabra, we passed by several Kiva borrowers: a father and son Al Majmoua borrowers. An electronics shop owner, who’s been with Kiva for more than 5 years, a stationary supplies business owner, and finally we met with Abd. Abd has been with Al Majmoua for more than 9 years; he recently took out his 11th loan from Al Majmoua. He was so happy to see us and offered us snacks the minute we arrived at his falafel stand. I couldn’t ask for a better introduction to the world of micro-finance in Lebanon. Ismail, who I should probably write a whole separate blog post about, was a wonderful guide. I’m looking forward to more field visits and borrower interactions! As I mentioned previously, I will be working as a Kiva Fellow at Al Majmoua. Today was my first day in the office! I arrived a litter after 9:00 a.m. and after attempting to find the office building myself (Lebanon lacks a proper address system this is in huge part to the Civil War and the country’s constant rebuilding efforts for the past 2-3 decades). I called Alia, the Business Development Manager and HR Manager at Al Majmoua. Alia came and picked me up from the around the corner – I was literally a 100 ft. away from the office, but had no idea. She walked me into the office and promptly started introducing me to everyone, about 30 people in the office (I’m so happy they didn’t quiz me on names and departments). After the quick office tour, we sat down for a chat in her office. She walked me through Al Majmoua’s history, their current portfolio, the Lebanese micro-finance industry and finally we talked about ME! We talked about the Kiva projects I am going to be working on and how much time I will get to spend in the field meeting borrowers. Al Majmoua started in 1994 as a Save the Children funded project. Three years later, it became became a locally licensed NGO serving 3000 female clients with group loans. In 2000, Al Majmoua created it’s first Individual Loan product and started serving men. And 6 years later in 2006, Al Majmoua started its non-financial services providing vocational and financial training to both borrowers and non-borrowers. Al Majmoua’s competition in Lebanon is growing everyday and although they have a healthy market share; they have to stay innovative and client-focused to stay ahead. And I’m happy to hear that their home will also be mine for the next coupe of months. I should change the title of this post to “INTENSE Kiva Time in San Francisco”! It’s the Kiva Training week – a week packed (to say the least) with learning, talking, excitement, meeting people, social activities, and did I mention learning?! Every Kiva Fellows Program class goes through an intense week of training at Kiva’s HQ office in the heart of San Francisco’s Mission District. 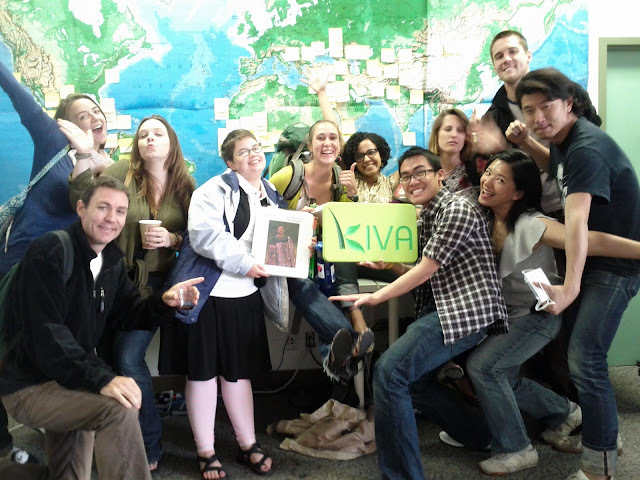 Kiva Fellows travel far and wide to come to this training week. Our agenda is packed with training sessions and social activities. We start every day at 8:30 a.m. and go till about 5:30 p.m. and sometimes later. There are 20 or so people in the class this time around. We’re the 15th Kiva Fellows Class, hence the KF15 I have been mentioning a lot. Everyone is so interesting and extremely excited. People have traveled from as far as Australia, the UK and Germany to be a Kiva Fellow. And people’s backgrounds differ tremendously from graduate students to finance professionals to fresh grads…we’ve got it all. The week is almost over and I feel so connected to people I met less than a week ago. Maybe it’s the fact that we will all be going through something similar in less than a month. Or maybe it’s the fact that we believe in something…be it micro-finance as a means to achieve economic and sustainable growth in the world, or Kiva itself, or travel, or maybe it’s all of the above. But there’s definitely a connection that is being built with the fellows and the Kiva staff. I think saying goodbye to everyone will not be easy. A few months ago, I was sitting with my roommate, Liz, back in my apartment in San Francisco. We were both talking about the future and what we want to do and all those quarter-life-crisis questions about life and what really matters that I’m sure you’re all aware of. She mentioned that her friend, Caitlin, is going on a Kiva Fellowship. I had heard of Kiva before and thought it was an amazing idea, but I really didn’t understand the WHAT – HOW of it all! Later that evening, I remember staying up all night on the Kiva website reading about how it all started and listening to this amazing TED talk by Jessica Jackley, co-founder of Kiva.org. I was so inspired by the idea of using internet technology for a greater good. That night I remember going to bed with a sense of excitement. A few weeks later, Liz introduced me to Caitlin and we met up. We talked about Kiva and her upcoming fellowship. I was so incredibly excited by the idea that I started working on my application that week. And a few weeks later I completed my application and submitted it. As part of the Kiva Fellowship application each applicant is requested to submit a Motivation Statement on a WordPress blog to prove that the applicant is in fact capable of blogging – here is mine for your enjoyment. In mid-November, I received my acceptance letter to the Kiva Fellowship program for the KF15 Class departing in May. I know I’m going to the Middle East somewhere – Kiva works in Lebanon (serving Iraq), Jordan (newly added) and Palestine at the moment. My first choice is The West Bank, Palestine, but I’m excited about the idea. So much planning is going to have start happening.